The Keystone Elk Country Alliance worked with the WPPSEF to construct a 3,200 sq. 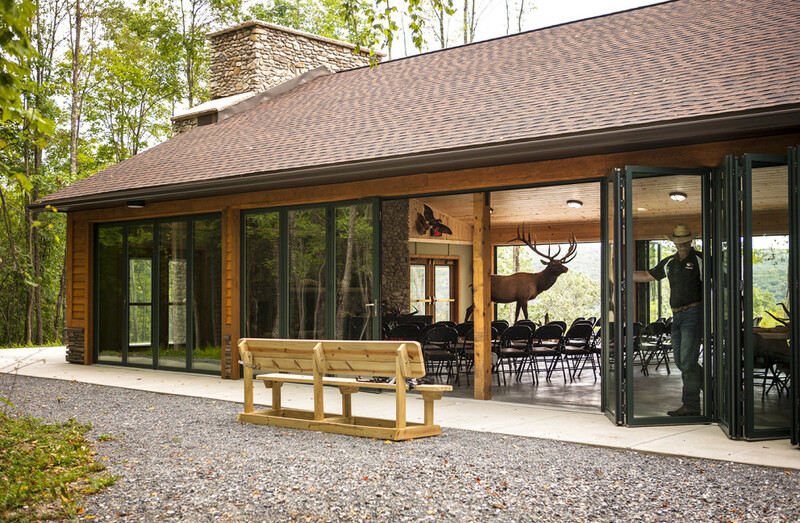 ft. outdoor educational classroom (ECCO Building) at the Elk Country Visitor Center in Benezette, PA. Elk herds are an unforgettable sight for the more than 400,000 guests that visit the Elk Country Visitors Center each year. The outdoor classroom was constructed to LEED standards. The ECCO building is heated using a Froling FHG-30 high efficiency biomass wood boiler with a rated heat output of 102,500 Btu/hr. The biomass boiler system includes a 400-gallon thermal storage tank that will provide renewable heat for the classroom through an in-floor radiant heat system. The ECCO building is enclosed using state-of-the-art folding glass NanoWall technology, which provides year-round use of the facility. WPPSEF provided $625,000 to support this Elk Country Visitor Center expansion. The ECCO building was dedicated on August 15, 2015.